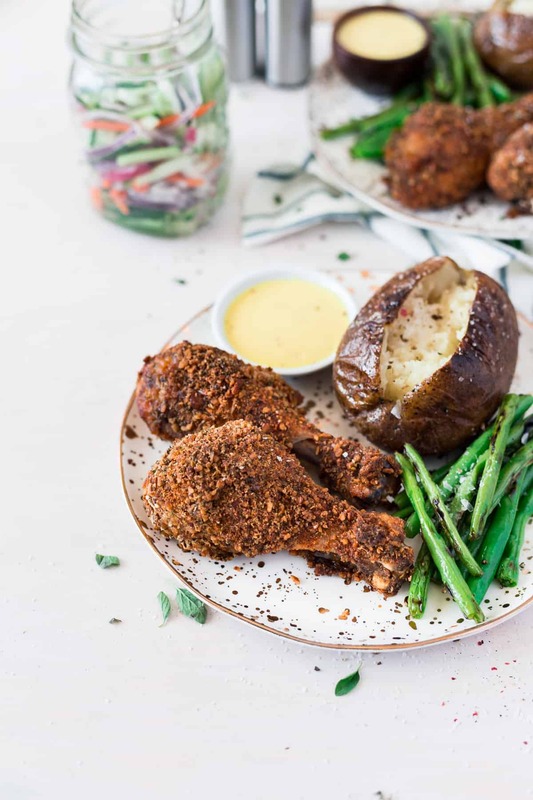 Delicious crispy baked chicken drumsticks made with a homemade pretzel and spices coating which makes the crispiest chicken legs on the block – no frying needed! 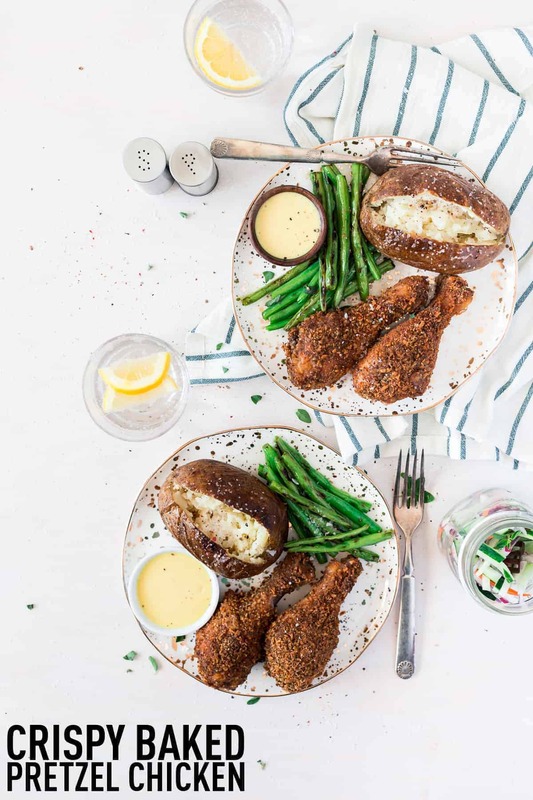 Did your mom ever make you shake and bake style chicken or pork chops when you were a kid? 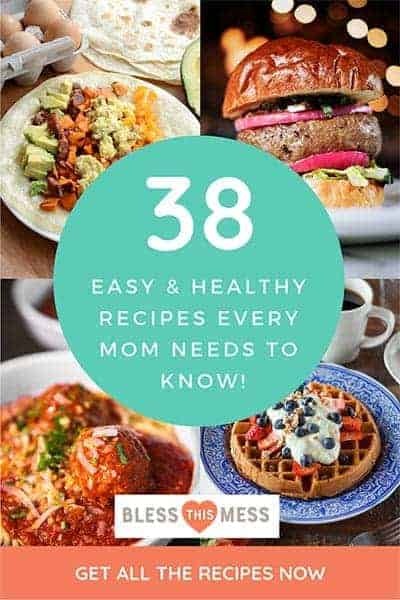 My mom did, and I loved that crispy topping that kept the meat extra moist and gave it tons of flavor. 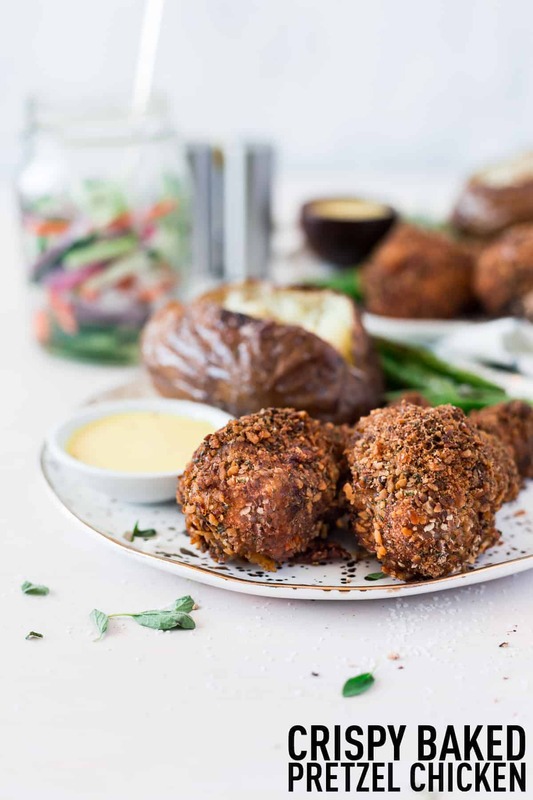 I’m sharing with you today a crispy baked chicken drumstick recipe that uses pretzels in place of bread crumbs in a homemade shake and bake! It’s a fun twist on a classic and you are going to love the results. You all know I love bone-in chicken. 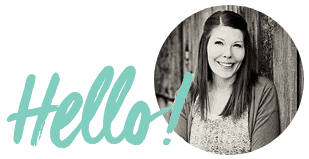 It doesn’t dry out, my kids love it, it’s inexpensive, and it’s so versatile. 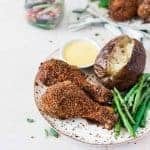 My super simple baked chicken legs are one of the most popular posts here on Bless this Mess, so I know you all love chicken legs, too. I also like that they can be served year-round. You just change up your sides to go with the seasons! These crispy drumsticks go with just about anything. Summer: I’m all about simple and seasonal in the summer. I’d serve this with fresh green beans, corn on the cob, and some watermelon. If I’m wanting to make the meal go even farther, I’d make one of my 8 favorite pasta salads to go with it! Homemade dark chocolate and peanut butter ice cream for dessert, no questions asked. Fall: No-knead bread is always a favorite in the fall at our house. It smells like home with so little work. I’d also serve it with a fall side salad and some roasted Brussels sprouts. Extra thick pumpkin cake for dessert or sliced apples and our favorite caramel dip. Winter: The best butter biscuits or sweet potato biscuits OR baked potatoes on the side with a winter salad and some roasted butternut squash (mashed with butter and salt). For dessert, we’d make snow ice cream or have our forever favorite chocolate chip cookies. Spring: Santa Fe Rice is such a great addition to simple chicken legs. I’d serve it with roasted spring veggies or sauteed asparagus and a spinach salad. For dessert, I’d make rhubarb crisp. See? So easy to make one main dish a seasonal meal by changing up the sides that go with it. This couldn’t be easier, friends! Make a homemade shake and bake with pretzel crumbs and spices and toss your chicken in it. Done and done. The secret to getting them crisp though, is spraying them with a bit of oil before baking. Don’t skip that step. Did you know that they make gluten free pretzels? I like the Snyder’s of Hanover brand. So if you or a loved one eat gluten-free, that’s an easy substitution so that you can still enjoy this recipe. 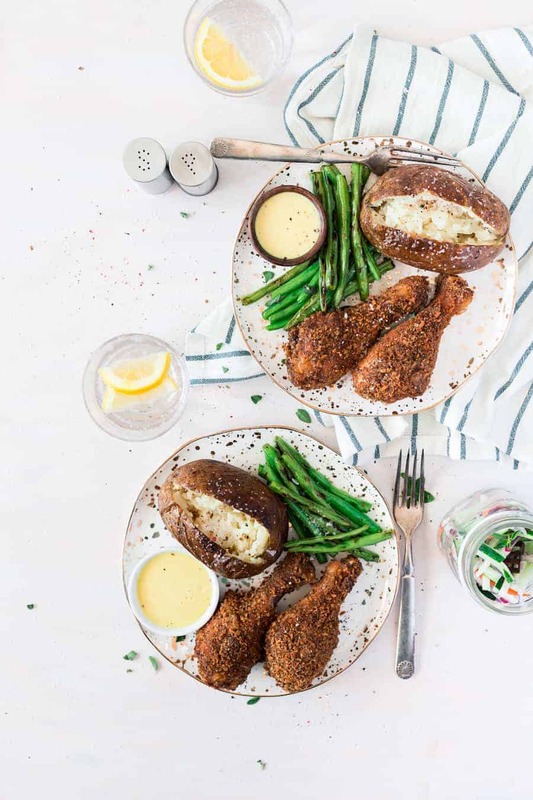 This chicken is great dipped in a honey mustard sauce! I like to use an instant read thermometer when it comes to cooking meats. That way I don’t under OR overcook! As one of my most used kitchen gadgets, it’s well worth the roughly $13. Preheat oven to 350 degrees. Prepare a large baking sheet by lining it with parchment paper, then set aside. In a large bowl, whisk together the crushed pretzels, onion powder, oregano, parsley, paprika, garlic powder, salt, and pepper. Roll each drumstick into the pretzel mixture then carefully transfer each piece to the baking sheet. Do not discard the leftover crumbs. Lightly spray the drumsticks with the canola oil, cover loosely with aluminum foil, and bake for 45 minutes. Remove drumsticks from the oven, then top each drumstick with a sprinkling of the leftover pretzel mixture. Spray liberally with the canola oil, then return to the oven uncovered for an additional 45 minutes. Serve immediately. To create the pretzel crumbs, you can place the pretzels in a plastic bag and smash with a rolling pin, or place in a food processor and pulse until a crumb mixture forms. How simple and crispy do those look? I can’t wait for you to make these crispy baked chicken drumsticks, all year long. Enjoy from my kitchen to yours! I love that you used a pretzel coating! I’ve never tried it, but I definitely want to now. Especially after you mentioned dipping it in honey mustard – yum! Thanks for sharing!